A till is nothing other than a sliding tray installed within a chest or drawer, like the ones that are used to keep notes and coins in a cash register. 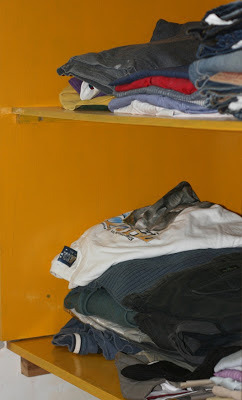 Small tills are used to accommodate cutlery and other items inside a larger drawer and so on. Tool chests too have tills that slide on runners attached to the insides. 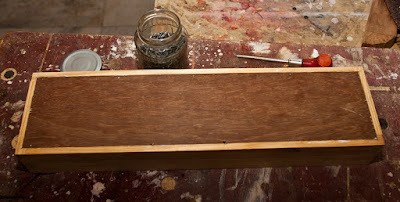 I needed to make a couple of tills for a small tool chest I am in the process of building. I made one with dovetails and decided to make the other with box joints. It occurred to me that a great many woodworking objects, including drawers and boxes, resemble a till in some fashion. Also, the humble box joint is adequate in a number of applications. 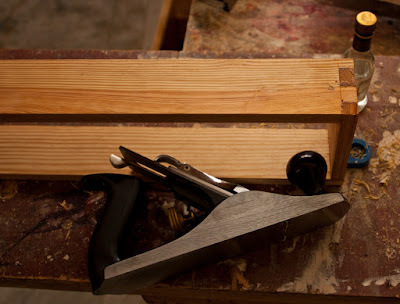 All aspiring woodworkers would therefore be well advised to practice this simple but effective joint. Here is a brief account of how I went about it; perhaps there are better ways and as always I welcome comments and suggestions on how to do it better. 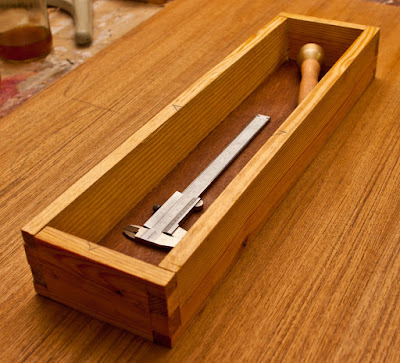 This project requires a few basic hand tools including a sharp saw (mine is a Japanese Ryoba but any other saw will do), a pen or pencil, square, marking knife, marking gauge, coping saw, chisel, assorted clamps and mallet. (The photograph above shows everything except the mallet, clamps and marking gauge). 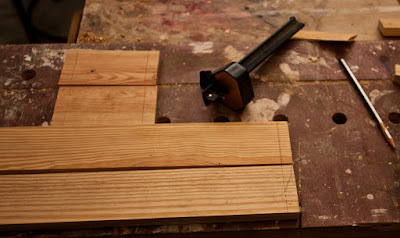 As in all projects wood has to be first milled and the cut to size prior to joining them. I have had some pine lying around for some time now; most of them had warped but I managed to rip out several acceptable pieces. Pine is ideal for such a project chiefly on account of its forgiving nature. Unlike some hardwoods such as Teak, the fibres of Pine compress and a less than perfectly cut joint can often be made to fit with light hammering. 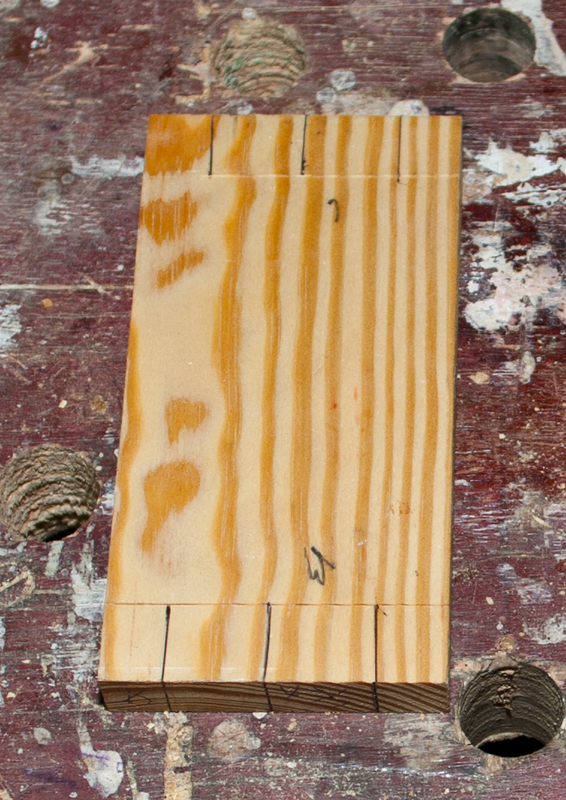 Similarly a somewhat loose joint is compensated by the swelling of wood fibres when glue is added. Nowadays many varieties of Pine are being imported into India and are available at local timber shops all over the country. 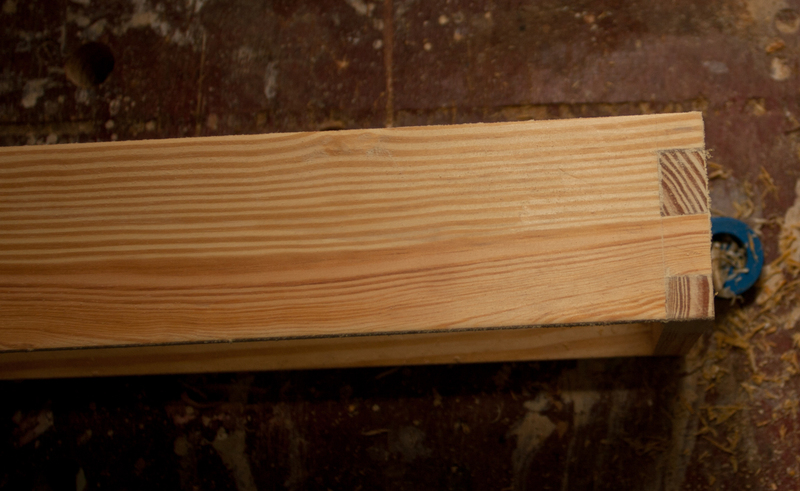 A lot of poor quality Pine is used for making batons for construction purposes; avoid these and look for furniture grade Pine. After milling the pieces mark them with cabinet maker's triangles so that they can be put together in the manner intended whenever required. It is imperative to know how the sides will go together. I have ruined my work at times by not marking them correctly and then getting confused about the correct pairing of sides. 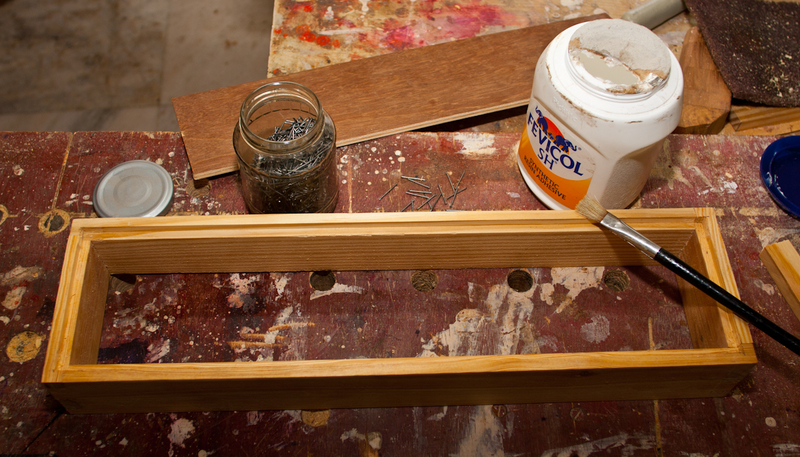 Use a marking gauge to scribe lines along the edges that correspond to the thickness of the pieces. Mark out these lines very clearly because they mark the depth to which the joint will have to be cut and will mark the shoulders of the joint. 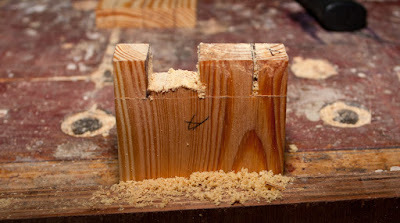 Place the two mating sides of the joint in a vice and mark joints to be cut. In fine furniture making you will wish to make each of the joints symmetrical but here I have drawn the lines somewhat arbitrarily. 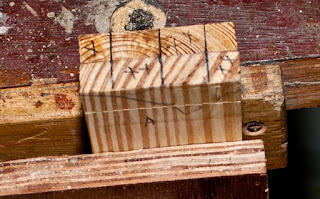 Now extend the lines marked on the end grain to the line inscribed by the marking gauge. If using softwood such as Pine, saw on the waste side of the cut keeping the pencil line. This will ensure a tight fit. In the case of hardwood it would be preferable to cut to the line since the fibres hardly compress. I used a coping saw to cut out as much of the waste as possible safely without disturbing the shoulder line. The end pieces were sawn off while the rest of the waste was taken out with a chisel. Here is it is critical to ensure that the shoulder line is not disturbed or moved. The shoulders should be clean and crisp. This will make the joint both fit and look nice. Once the pieces are ready, they should be dry-fitted to check if they seat properly. Often minor imperfections, little leftover slivers and so on, prevent a good fit. These could be cleaned up at this stage. 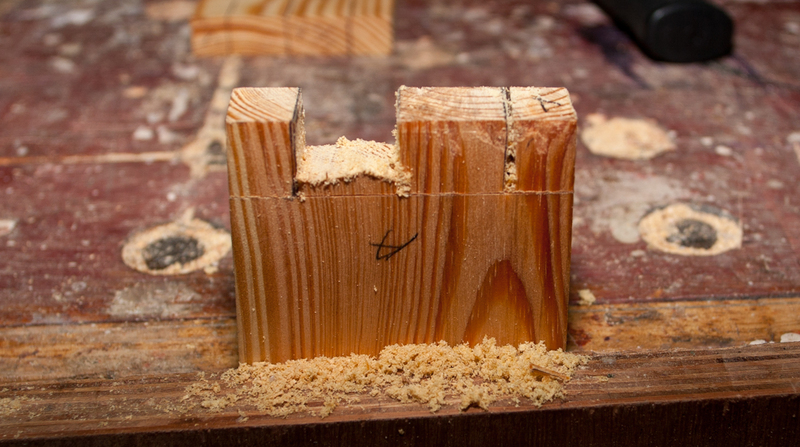 If the joints protrude a bit do not worry; they can be planed and sanded down later. 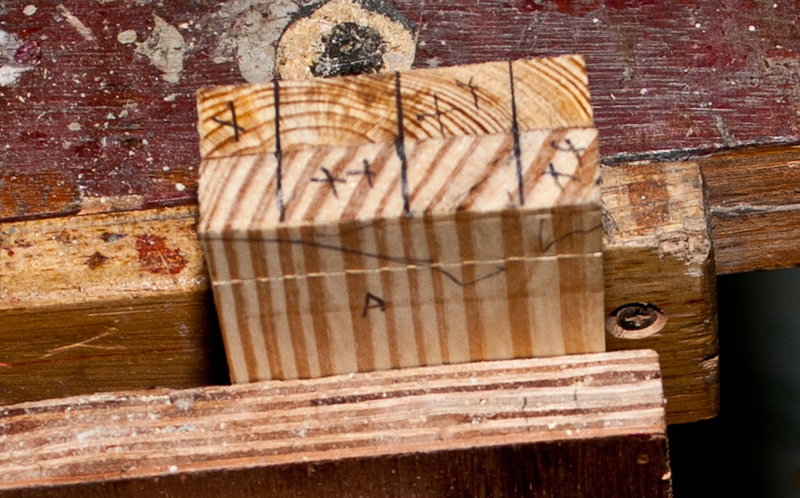 I prefer to set the depth of the marking gauge to a little more than the actual thickness of the wood so that the finders of the joint protrude marginally; once planed flush the joint looks perfect. After satisfying myself that the fit was acceptable, I glued up everything with PVA adhesive and a set of clamps. The long sides of the till bended a little with clamping pressure but hopefully will spring back once the clamps are removed. It is more important at this point to ensure that the till is symmetrical. This is checked by measuring the diagonals and ensuring they are more or less equal. In this case I found a discrepancy of about 1/32nd of an inch but could not do anything about it because one of the sides was slightly thinner than the others and has sunk in more than the others. The mistake was in the milling process; fortunately the error was not too great so I let it be. 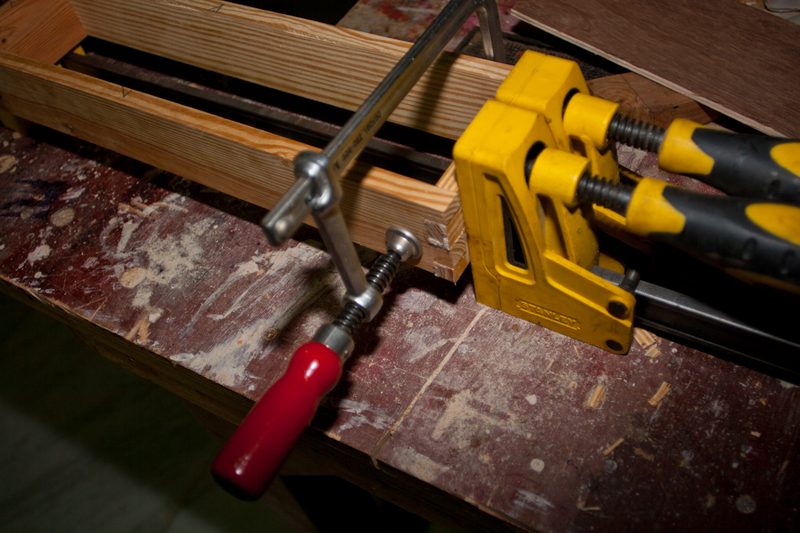 Putting clamping pressure in a manner that draws all four sides tightly together is essential. I let the glue dry overnight and next morning planed the protruding fingers flush. I then sanded them with 180 grit paper. After planing and sanding the joint looked much neater. The till sides have come together neatly and now require a bottom. I normally would have glued and nailed a 6mm plywood piece to the bottom but in this case used my router fitted with a rebating bit to cut out a rebate to take the bottom. This was necessary because after measuring the insides of my tool chest I found the addition of an extra 6 mm to the bottom would raise the overall height of the till which would cause it to interfere with the upper till. 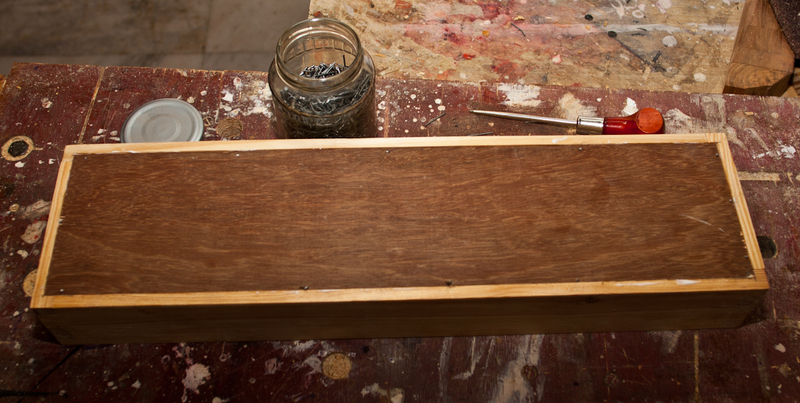 After squaring the corners of the rebate, I used glue and pin nails to attach the plywood bottom. The bottom was cut slightly oversize and then planed to fit as neatly as possible into the recess. After a bit of light sanding the till was ready for tools. I will wax its bottom edges to make it move smoothly inside the tool chest when that is ready. Finally your Till is looking beautiful. Perfectly cut box joints makes it more impressive. I like pine wood because of its age rings and colour. Why dont you use wood instead of ply for bottom ? A piece of plywood spoil its beauty (just my opinion). going tool chest. See you soon with your Tool Chest. Best of luck.. I agree that plywood spoils the look but here I used ply because the bottom needed to be as thin as possible or else I would lose a lot of space in the till. Also, since I do not have a bandsaw and in Greater Noida area bandsaws are not allowed (for some incredibly stupid reason) I cannot resaw pieces of wood. Re-sawing by hand is a very time consuming process. It is hard to believe that bandsaws are not allowed in a City like Noida. I have been there and saw the city is in its full development phase. Greater Noida is really a Very green and well planned city. 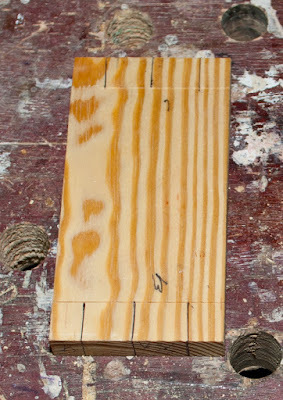 Any way you can just cut some thin strips on you table saw and glue them to make as sheet. I use this Technic for my projects. I suppose I could do that but that is a bit of an overkill at times especially when the use of the object is more utilitarian than decorative. I love your article on making a till. I enjoyed reading your thoughts on the different woods you've found available in the market and was glad to know that I should be asking for 'furniture grade pine' to avoid getting the predictably terrible pine that is commonly found in Gurgaon. I believe you mentioned in this post (or perhaps a different entry) that you have gotten a few of your hand tools (like the coping saw used in this project) from Shobha tools. I have emailed them to ask for quotes but they are slow getting back to me and I thought about visiting their office. 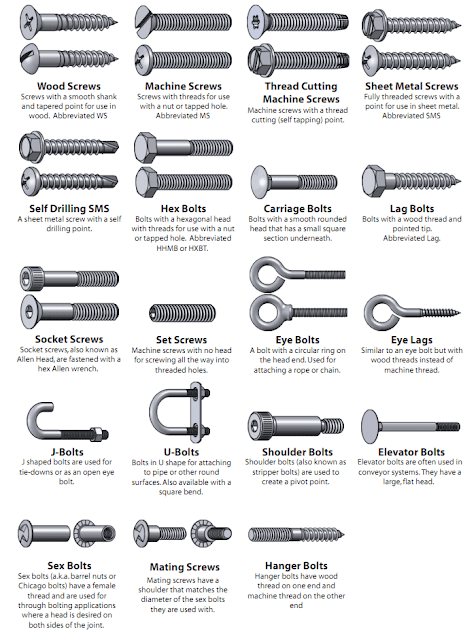 Do you think this is the best place to find their tools or do you have a go-to shop that stocks them?